California Livin Home: FUN FACTS FRIDAY -+-+- Interesting facts on the Cranberry! FUN FACTS FRIDAY -+-+- Interesting facts on the Cranberry! As a kid I was never one to want a serving of the Cranberry sauce at the Thanksgiving table. I wanted to wait for the Pumpkin Pie. I don't know if it was the gelatinous-jiggle look it had out of the can or for that matter that all the "older" relatives liked it, (what kid wanted what the Aunts and Uncles thought of as yummy...they also thought Fruit Cake was good -- NOT ME!) As I grew older though and my tastes changed, literally, I decided it would not hurt to take a taste from the infamous cranberry dish after so many years of hating something I had never tried. To my delight, I liked what I tasted. I don't know if it was because it was more of a chutney than just the blob that came out of the can but I liked it! Today I wanted to post a little more info on the Cranberry since Thanksgiving is less than a week away. 1. Cranberries are one of only three fruits that are native to North America. It's a wild fruit that grows on long-running vines in sandy bogs and marshes, mostly in the Northeast, but also in the Pacific Northwest. 2. Native Americans were the first to enjoy cranberries. They mixed deer meat and mashed cranberries to make pemmicana—a survival food. They also believed in the medicinal value of cranberries—long before science discovered cranberry's health benefits. 3. Native Americans also used the rich red juice of the cranberry as a natural dye for rugs, blankets and clothing. 4. Cranberries were called “sassamanesh” by Eastern Indians. While the Cape Cod Pequots and the South Jersey Leni-Lenape tribes named them “ibimi,” or bitter berry. It was the early German and Dutch settlers who started calling it the “crane berry” because the flower looked a lot like the head and bill of a crane. 5. It wasn't until the 1800's that people began farming cranberries. At first growers would pick the cranberries by hand. Today most cranberries are harvested using a technique known as wet harvesting. That's when the bog is flooded with water and the cranberries float to the surface, where they are easily scooped up. 6. Sailors once used cranberries as a source of vitamin C to prevent scurvy. Besides Vitamin C, we now know that cranberries are also full of antioxidants that help cleanse and purify the body. 7. Some cranberry bogs are more than 100 years old and still produce today. 9. Americans consume some 400 million pounds of cranberries a year, 20 percent during Thanksgiving week. 9. American recipes containing cranberries date from the early 18th Century. You can make this Chutney ahead of time so you have more time for all the other goodies you will be making, plus more time with your family instead of the kitchen! 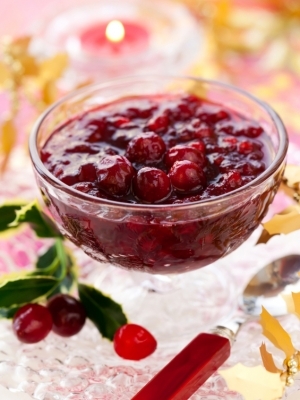 This cranberry classic will go great with your turkey and stuffing. 1. Bring all ingredients to a boil, reduce heat and simmer for 40 min. 2. Store in a clean jar for up to 10 days.